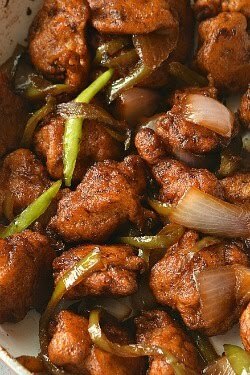 Perfect restaurant style Indo Chinese Chili Chicken recipe will give you that exact recipe you are looking for to make at home. Very easy steps to follow to make perfect Chili Chicken ! 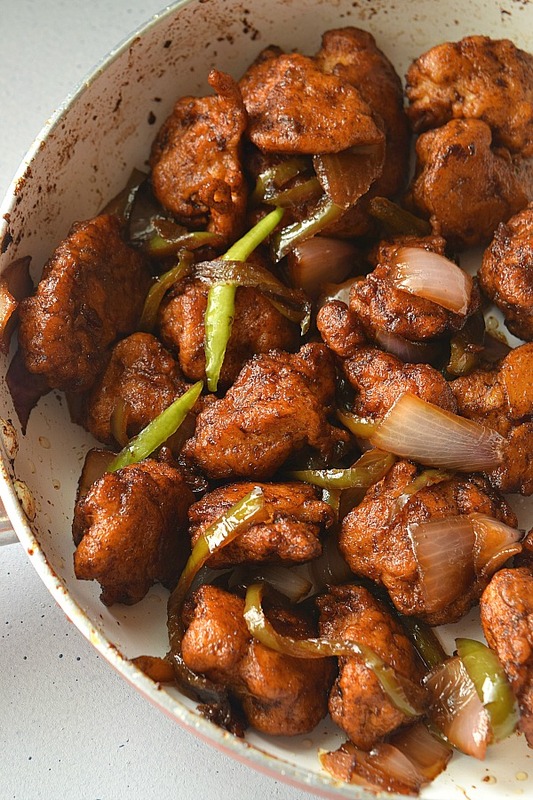 A very famous Indo-Chinese recipe I will share here today and a very common is most of the Indian Restaurant Menu's,its Chili Chicken Dry. Being a Indo-Chinese cuisine fan,I like to have this most of the times when I visit restaurants. I am not sure from where the name originated or why and I have no idea if the authentic Chinese cuisine even have this kind of dish but in India / Asian restaurant menu's its a HIT! There are two versions of this dish one is dry and other is semi-gravy one. 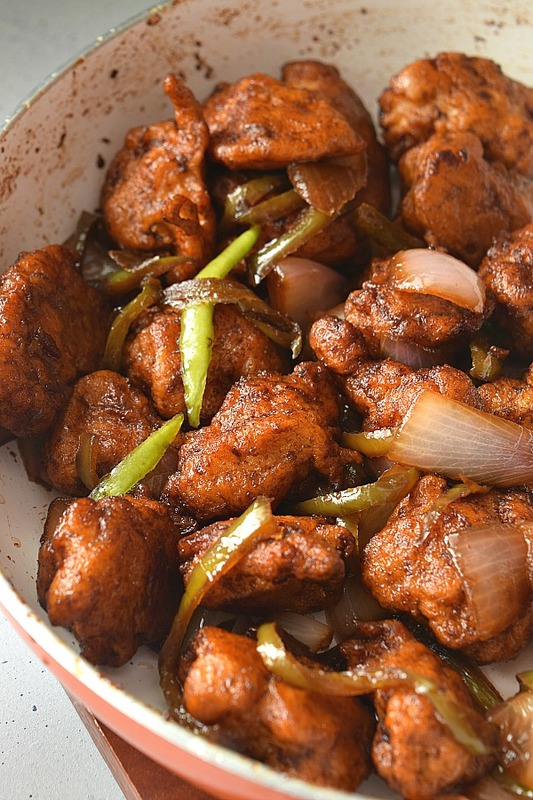 The dry version is the recipe that I am sharing here,its basically the deep-fried chicken chunks tossed in veggies and some basic sauces and to be eaten as an appetizer or a bite sized serving. Rather the semi-gravy version is the one when all the steps and ingredients remain same as here but a slurry of cornflour is added to this to make it with gravy. 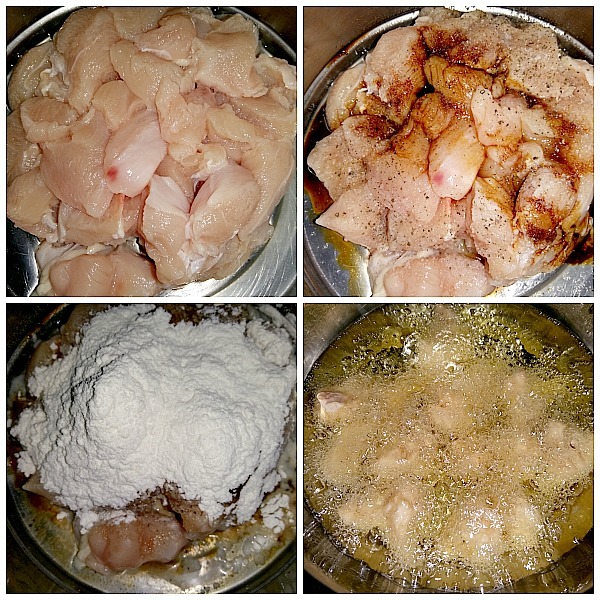 Firstly,you need to wash and dry the chicken breast / boneless piece with a kitchen tissue. Make bite sized pieces of this and marinate with salt,black pepper powder,soy sauce and vinegar. I do this as the chicken pieces taste delicious on frying with this marination. Further add Egg(optional),cornflour and All Purpose Flour and coat the pieces well,fry them on medium flame. Next in a skillet / stir-fry pan,add coconut oil or any oil of your choice,when its hot,add the ginger-garlic and chili pepper,crushed and saute till it oozes great aroma. This step actually gives that feeling that you are cooking some awesome Indo-Chinese street kind of Chili Chicken. Next add veggies of your choice,little salt and black pepper powder. Next add white Vinegar,tomato ketchup,red chili sauce and soy sauce. Toss further till veggies are cooked and finally add the chicken pieces. Toss well and serve immediately. 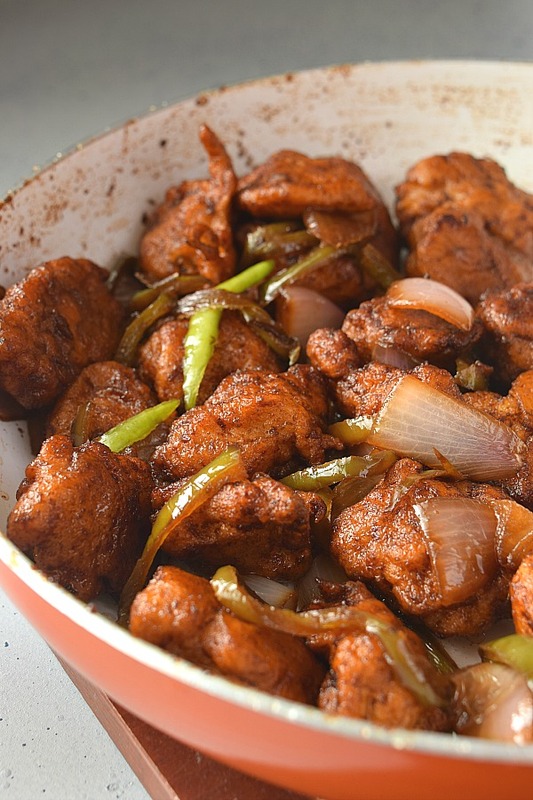 Perfect recipe of how to make restaurant style Indo - Chinese Chili Chicken Dry! 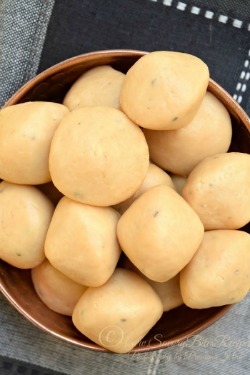 Cut it into bite sized pieces and marinate with ingredients mentioned under "Marination". Add little water to make the flour little smooth and not very dry and sticky. 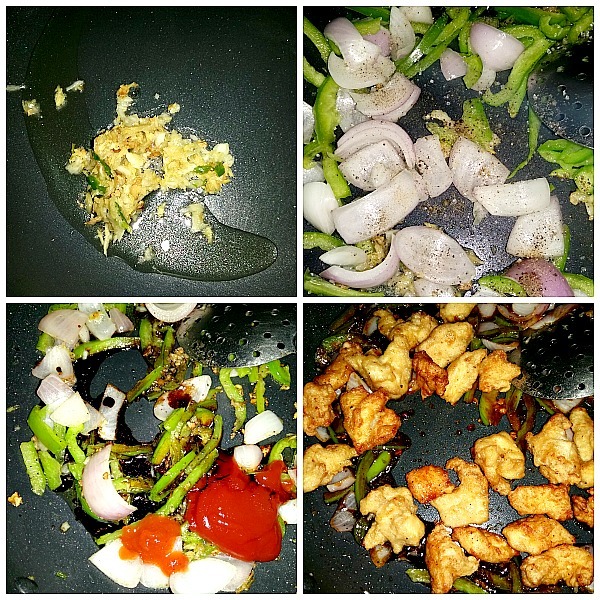 Heat oil in deep frying pan,and when its hot,slowly drop the chicken pieces and fry on medium flame. Once done,drain and keep aside. In a Stir-Fry Wok / skillet,add coconut oil(I have added 2 Tablespoon). When it shot,add the crushed green chili pepper,garlic and ginger. Saute it for a while, and add veggies,salt,sugar,pepper powder. After a minute,add the sauces. If you feel that the sauces are less in quantity then increase them as per personal preference. Finally add the chicken pieces,toss well so that all sauces and veggies are coated well. Oh my...how delicious does this sound? VERY!! I can just imagine how good all those spices would taste. This is a true crowd pleaser, and I think everyone would be fighting over the last delicious piece. I'm replying here because I couldn't find anywhere where I could comment. Really weird. The chicken sounds and looks delicious. It's spiced up just the way we like it. This would be a great dish any day of the week. I haven't chicken this way before but it's time that I did. 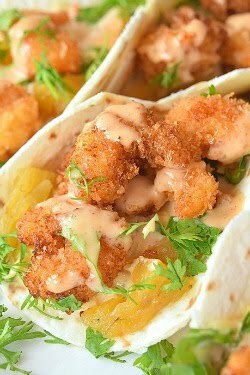 This looks so delicious AND like a quick easy weeknight dinner. I love all the spices going on here! I can just imagine this over a bowl of rice with the seasoned chicken and loving every bit of it. This looks absolutely delicious - definitely wonderful as a bite-sized appetizer! And really interesting that you can so easily convert it into the wet version, too, with just a cornflour slurry to make a gravy - perfect as a meal! So many flavors here - I really think me family would love it! Thanks for the great step-by-step photos, too! Now the comment bar shows up. When I commented above it wasn't here -- I looked several times. Very odd. Regardless, I love the sound of your recipe. Will give it a go and your photos make it look very easy. This looks delicious! What's the best substitute for maida in the US? Can I just use regular flour? I had this yesterday at home, my kids love chili chicken. Looks absolutely addictive and delicious! This is an awesome way to change up a regular chicken dish! All of the flavors sound wonderful. It can be difficult to season chicken, but in this dish it looks perfectly seasoned super flavorful! 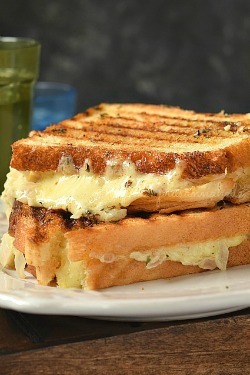 This would be the perfect way to use up the chicken I have in the freezer right now, just begging for a purpose! oh wow, this recipe reminds me of a recipe that I had when I was growing up. Your photo looks amazing! This sounds amazing! We eat a lot of chicken but my husband is admittedly growing tired of it. Can't wait to change things up with this recipe!